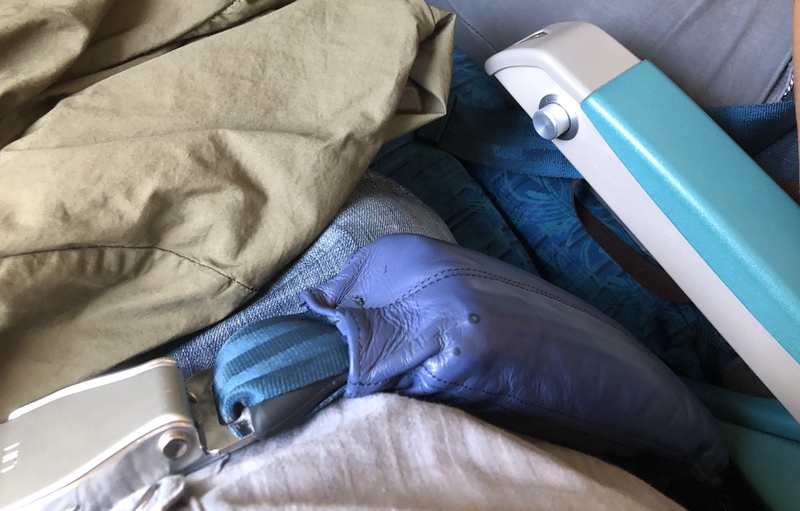 "legroom and recline was wonderful"
Seat width, legroom and recline was wonderful on Cathay Pacific premium economy seats for Boeing 777-300 flying from Hong Kong to Jakarta. The comfort of the seats, as well as the width and legroom was beyond my expectations. I liked the little tray under the IFE where I can store my little things. Eg. my glasses while i sleep, and store my phone when i charge it with the usb port that is right next to the IFE. "width is more generous than some"
Vancouver to New York. I decided to book a bulkhead seat as per usual. The seat width is more generous than some other airlines which have Economy Class in 3x4x3 configuration. 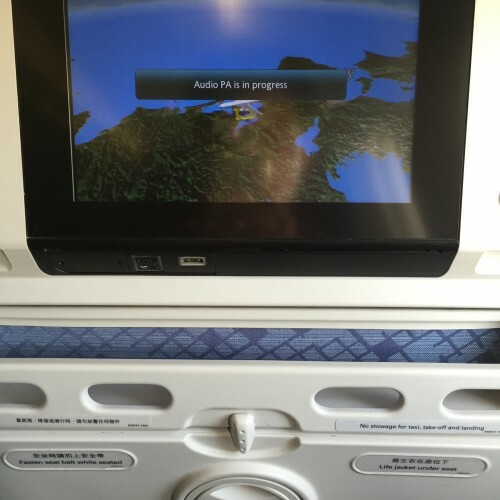 CX's IFE for Economy on the 777-300ER still has the 9-inch PTV, and with the extra legroom at bulkhead seats, it takes a bit of squinting to see what's going on. For some reason, either it was the person sitting behind me or the seat was kind of malfunctioning, I didn't get much recline. Overall, great airline with great seating products. I flew from JFK to HKG on CX last February. The flight was fairly comfortable (16 hours flight). IFE screen could have been larger as well as the seat legroom. The food was fine for economy, but the portion was not enough (for me), ice cream was offered for dessert at the main meal service. Crews were friendly. While flying on CX for many times I've observed that if you're an elderly or unaccompanied minors (as well as disables or people having trouble navigating through their seats), the crews would offer them seats in the front cabin (can be PE, can be business) if they're empty seats. 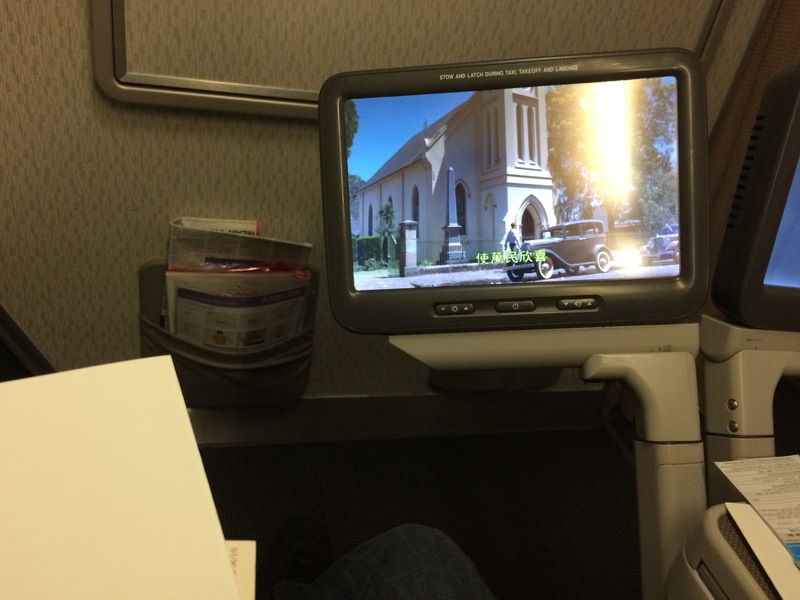 "Boeing 777-300 was quite comfortable "
SFO to Hong Kong. The seats on this old Boeing 777-300 was quite comfortable and has better legroom. Enough storage for putting my bags under the seat, TV screen was quiet near and there is a USB port under the screen. The seat power supply was under the seat means it's hard for me to find 1 to charge my laptop. The seat has better recline than other airlines I ever used. The width is enough for me as I am 1.7 m tall. 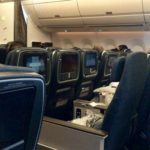 ✅ Verified Review | Shell seats on both flights operated by Cathay Pacific Airways two old Boeing 777-300s. The recline was as expectedly uncomfortable due to the shell seat design. Otherwise the seat is generally acceptable with good legroom and impressive entertainment system. The entertainment system is a touch screen which is easier to use, although operation of the system was not always smooth. Glad to see power supply was available but the socket was only for 3-leg electric plugs, impossible to charge with a USB plug. 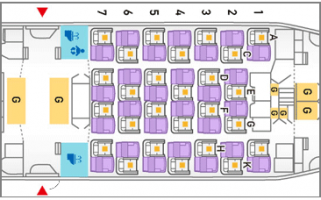 Prefer the 3x3x3 layout on CX over the 2x5x2 layout on Boeing 777 of other airlines. Seat 60A and seat 61K on new Cathay Pacific A330-300s. The seat was generally comfortable. The entertainment system was fantastic with a large easy-to-use touch screen. The width was fairly acceptable but legroom was a bit limited. Was quite happy with my seats. I was delighted to find that power supply was available. Economy seat on a 4 Class Boeing 777-300ER. The configuration is 3x3x3 layout with an 18.5 in seat width. Each seat has access to an AC power socket. I like the USB socket near the entertainment screen, and the little tray under it to put the menu, paper or your phone while charging. Legroom is good for economy class (32 in). The touchscreen IFE is good. The overhead luggage bins are a good size. 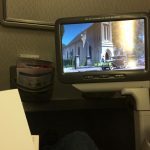 The combination makes for a good economy class experience. This was an overnight flight from Hong Kong to San Francisco. 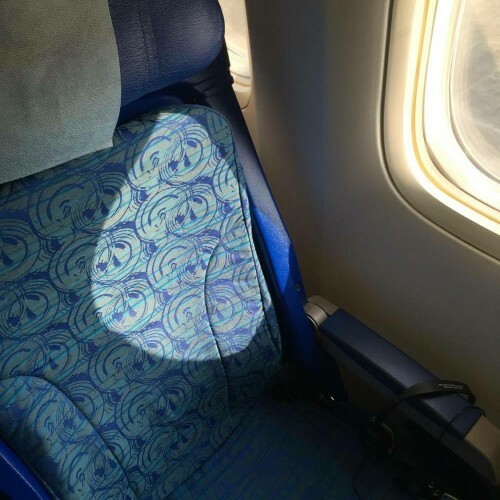 I was seated at a window seat. The seat was comfortable, plenty of legroom and the entertainment system had tons to watch. There was a power supply outlet under the seat as well as a usb connecter on the screen for easy charging. Flight Attendants were attentive and friendly. Food wasn't fantastic but it was good enough, came with a small fruit platter which was nice. "seat is good for economy"
HKG to SYD economy class on a 3 class Cathay A330-300. 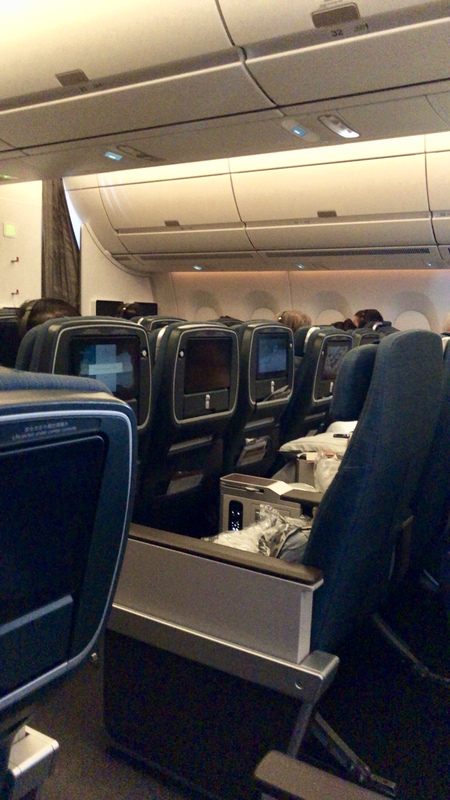 The aircraft is more crowded on an 8 across seat layout on the A330 than Cathay's 777s 9-across economy cabin which services two of the four daily flights on their busy Hong-Sydney route (the other two flights are with A330s). I would prefer to fly the 777 on this route but this overnight flight was on an A330. Having said that, the seat is good for economy. I needed to use my PC for half the flight and all the A330s I've flown on Cathay have AC power ports under the seat (with the Hong Kong/UK style plug). 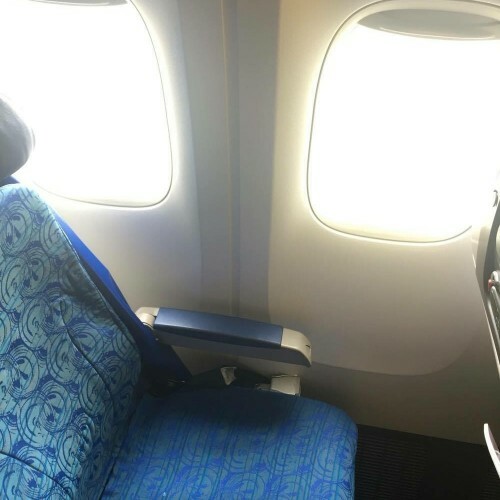 The seat width is 18 inches and pitch is 32 inch, which makes it slightly more comfortable on a full flight. 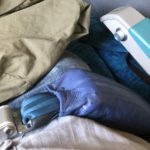 Seat recline on economy is not even worth mentioning on most airlines. I like the little tray under the IFE where (there is also a USB port) to store smaller thin object like a phone or books. Overhead bins on a Cathay A330 are not as spaces as their 777s. The touchscreen IFE hardware is good. 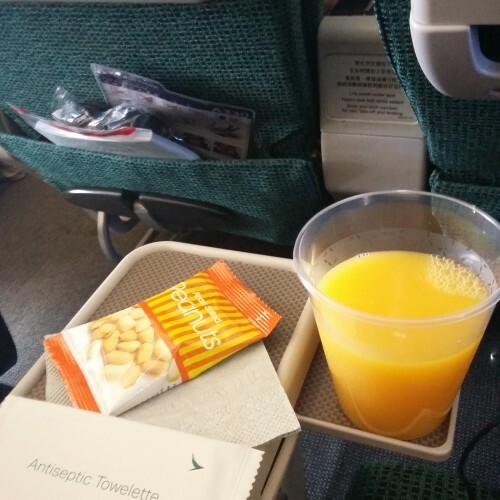 Travelled with Cathay Pacific in their Premium Economy from Nagoya to Hong Kong in Dec 2015, in seat 31E. Seat was spacious with 38" and 8" recline. Seat was more comfortable than economy class. Foot rest was available and managed to have a nap before reaching HK. USB port and electrical points was available in all seats.